My family vacation this year was a couple of days at Hershey Park, PA, the Sweetest Place on Earth! Unfortunately this was during a heatwave. The hat was to protect Snow-White-pale me from the sun. But I still had a great time. Here I am with a friend. Isn't she shiny? 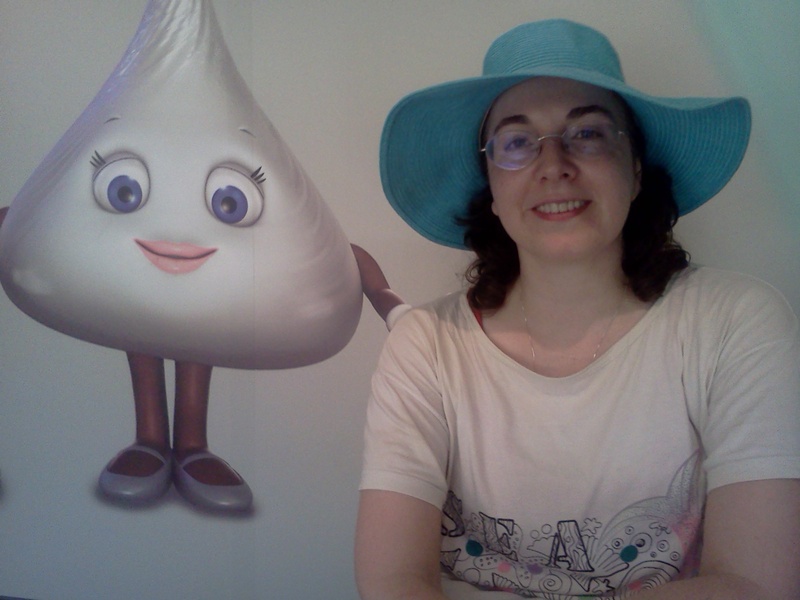 Here's me and a great big Kiss from Hersheypark! Hmm...don't think that's how shopping online works. 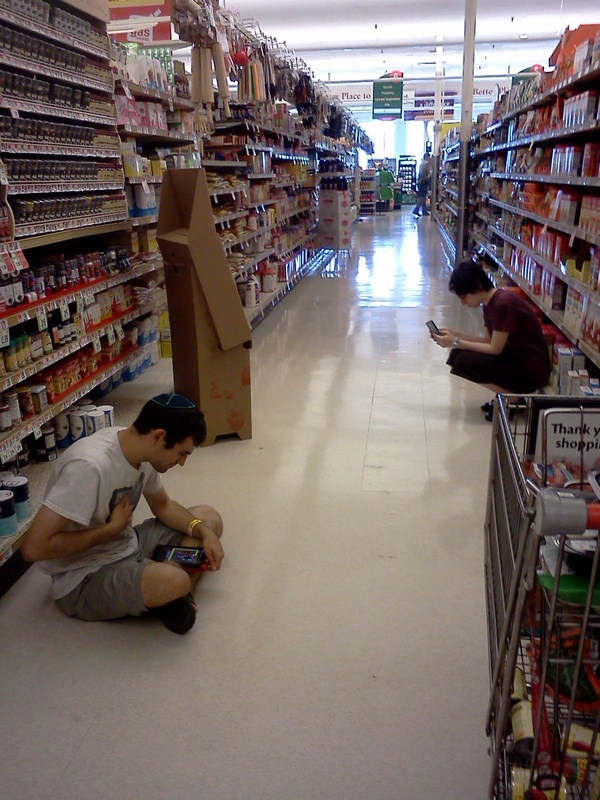 Tech geeks? My kids? What gave you that idea? P.S. My son's tee says, "I love my iPad", and here he's on a Kindle. 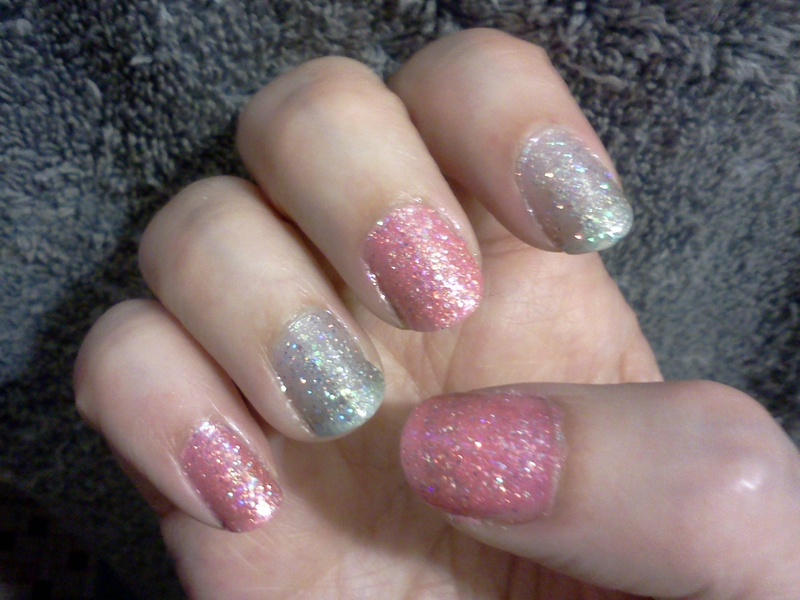 Sparkly pink or sparkly blue? I couldn't decide, so I went with both! I call this look "Indecision." 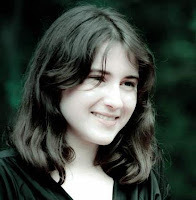 What advice would you give to a teenager who wants to be a published author? This is complicated. On one hand, you have to be realistic about the challenges facing you in the future and realize that you’re not going to get famous in a single day. Thinking otherwise sets up unrealistic expectations that may cause writers to get disillusioned with the publishing process as a whole. On the other hand, it’s important to remember that you will improve and people will begin to take notice of your writing in the long run. My best advice is to try your very hardest and keep on trucking no matter who tries to get you down, but also be realistic about how difficult getting published can be. Also, don’t count on writing to be your primary career. Even published author almost always have an alternative job that pays the bills. Writing isn’t all that financially lucrative, though it’s good for your spiritual health. Do you think entering contests is a good idea? If so, is there a contest you would particularly recommend that young writers enter? Yes and no. The trouble with contests is that on one hand you definitely increase opportunities for exposure of your writing. On the other hand, it’s easy to lose self-esteem if you lose at a young age. The best thing is to enter contests with realistic expectations and to keep striving to get better even if things don't work out. What’s the hardest part of writing and publishing a book? The most challenging aspect is two-fold. First, procrastination and getting easily distracted while writing is a major issue (especially with how readily available the Internet is these days). Second, and more seriously, is the issue of revision. It’s one thing to write a first draft. It’s an entirely different story to have the perseverance in editing your own work, going over and over until you iron out problems that may have cropped up along the way. It’s even harder to get halfway through a novel and realize you didn’t actually write what you wanted to write. At that point it’s important to step back and understand when it’s better to start over, not to mention having the willpower to do so. There’s a general rule of thumb that says it takes 10,000 hours of practice to get good at any given thing. I'm still nowhere near as good as I hope to be another five or ten years down the road, but I've spend a good amount of time working on various writing projects over the years that have helped refine my abilities. I also feel like it’s important to be more than just “an author.” Writing is for me a hobby, not a job. It’s something I turn to when I have inspiration rather than something I force out of myself. What are the advantages and disadvantages of publishing at your age? One of the easiest advantages to pinpoint is that the younger you are, the more unusual it is for you to have actually completed a book. Therefore it’s easier to get public and media attention, which will in turn help get word out about your writing. On the other hand, younger writers (including myself at my present age) still have a lot to learn about the world as we refine our philosophical perspectives and have new experiences to add to our existing repertoire. The younger you are, the more challenging it is to write an unusual and well-crafted work honestly worthy of public attention. What’s the single best piece of advice you've received? One of the things that’s always stuck with me is put your nose to the grindstone and work hard. Fairytales can come true, but not from wishing. You have to work hard every single day to make them reality, which is what I’ve tried to do these past years of my life. 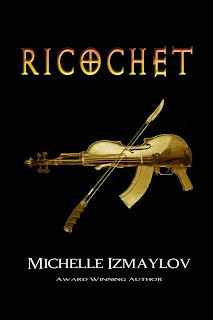 Michelle Izmaylov's latest novel, Ricochet, is available from Amazon.